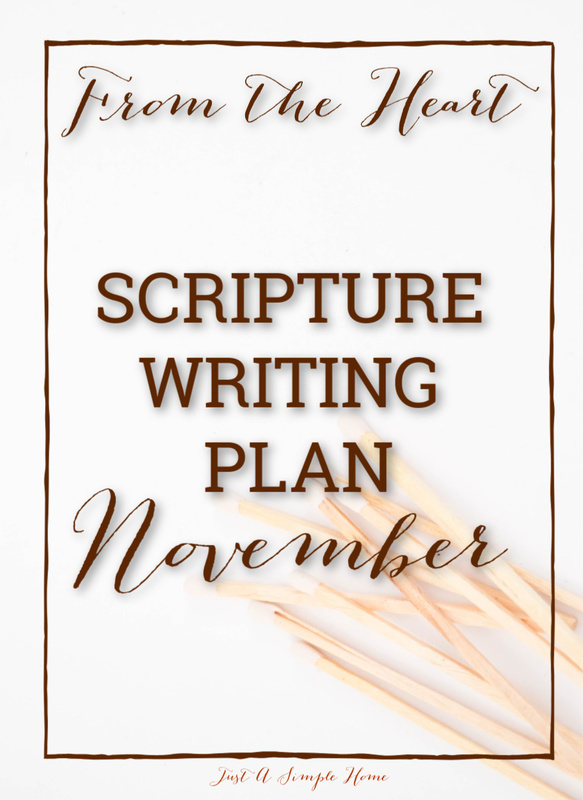 Join us in a Scripture writing plan for the month of November and copy down God’s Word. One of my favorite ways to read and study God’s Word has been to hand copy Scripture. I have been copying Scripture for about three years now and it, along with Bible Journaling, has completely changed the way I read and study the Bible. My daughters have started their own Scripture writing as part of their morning routine, which has been a blessing to watch. During the month of November, we will be reading and writing about GRATITUDE. I love this season, and I love everything about Thanksgiving. I am blessed to still have my grandparents with us and to be able to visit them and celebrate Thanksgiving with them. Since they are in their mid nineties, I know our time together is short and I am grateful for each moment I spend with them. As we start this new month and move into the holiday season, let’s move towards daily gratitude for the Lord! With thanksgiving, praise, wonder, and gratitude, let’s worship the One that has done so much for us! Although this should be daily throughout our lives, let’s be specifically intentional about it this month! Each of the Scriptures should take no more than ten to fifteen minutes a day to copy. Join me in spending fifteen minutes a day listening to God’s Word as He shows us what it means to be truly thankful in everything. Sounds really great. Its definitely something I will have to try. Does it help with memorization as well? I love your Scripture writing plans! Such a perfect way to meditate on the Word of God.